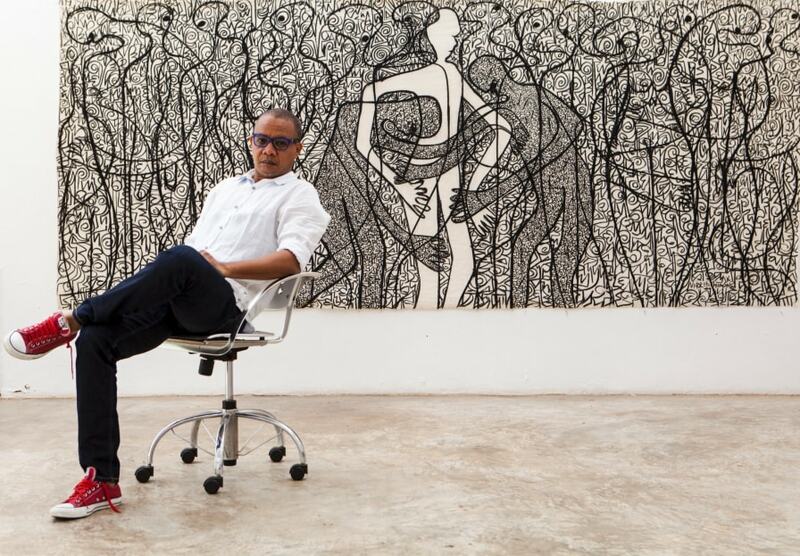 Victor Ehikhamenor, hailed as one of Africa’s most innovative contemporary artists, is a true polymath. He writes, paints, creates sculpture, and designs book covers for bestselling authors, including his old friend and fellow Nigerian, Chimamanda Ngozi Adichie. Chimamanda is no stranger to Victor’s vibrant Lagos studio, where visitors are likely to be welcomed with a glass of whiskey and lively conversation about all aspects of Nigerian culture. In this programme she finds him working on a whole new piece for an upcoming exhibition: a recreation of the outfit worn by kings of Benin, but made with thousands of catholic rosaries. Between Victor’s Lagos studio and the thronging Idumota market where he sources many of his materials, we hear two of Nigeria’s most notable artists discuss the vibrant and dualistic culture of their home country, the joy felt when an artwork takes on a life of its own, and the frustration when it refuses to cooperate. Join Victor and Chimamanda for this thoughtful and often funny exploration of art, music, sprituality, words and ideas.